Would you like lower energy bills? Most homeowners would, so it's no surprise that after home security, saving energy is the most popular reason to install smart home technology. The right smart thermostat can save you hundreds of dollars in energy costs annually, while also keeping your family more comfortable. Unlike programmable thermostats, they're easy to use and come with more ways to save energy than simple scheduling. What defines a smart thermostat? All smart thermostats are different, but share common features. 2: Sensors: as well as a temperature sensor, many smart thermostats have additional sensors such as motion sensors to detect activity, or remote temperature sensors for other rooms. 3: Automation: smart thermostats process intelligence from their sensors into automatic actions. The term ‘smart' describes their ability to learn your activity patterns—or better yet, to react to activity in real time—in order to save energy or make things comfortable automatically, according to your preferences. 1: More information = smarter thermostat. As a rule, the more sensors a smart thermostat has access to, the better it can read your activity to anticipate your family's needs, and the better your experience will be. 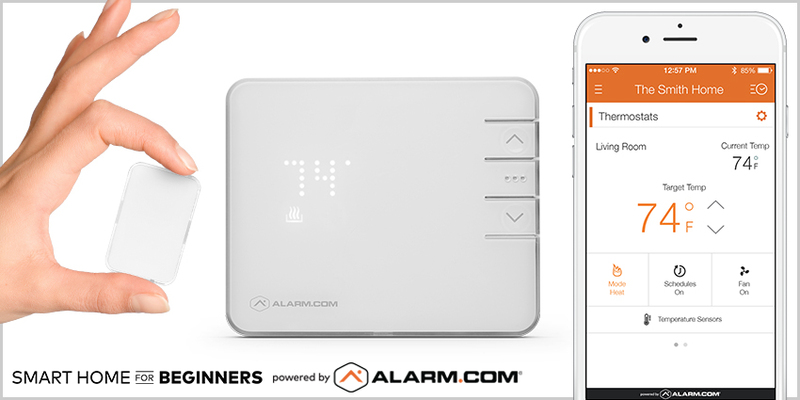 Alarm.com's smart thermostat is connected to every sensor in the house, including remote temperature sensors that give you precision comfort targeted to specific rooms. It even uses your smartphone as a sensor, enabling it to anticipate when you'll arrive home, and get the temperature perfect. 2: Compatibility matters. Smart devices should work together with other devices seamlessly. If you know you're going to upgrade your whole home with smart technology, look for a smart thermostat powered by a cloud platform. 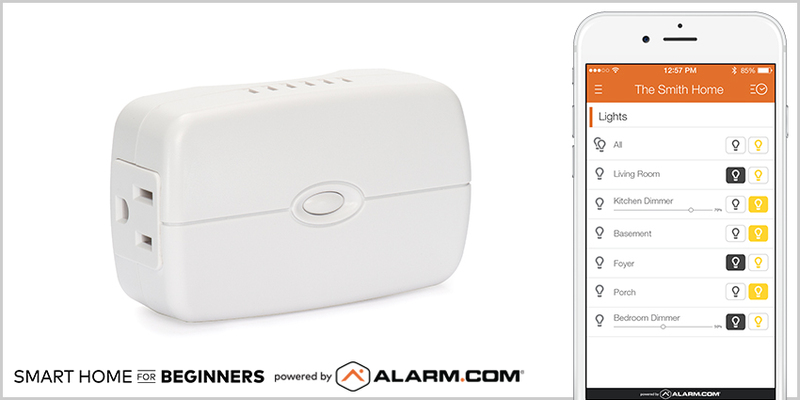 A whole-home platform like Alarm.com integrates the home's thermostat into an intelligent ecosystem with other devices connected to your security system. You can control your thermostat through the system's smartphone app, as well as via voice control or with a smart watch. 3: Installation can be tricky. To install a smart thermostat yourself, you'll need knowledge of heating and cooling systems and be confident with electrical wiring. Installing a smart thermostat wrongly can seriously damage your HVAC system. If you're unsure, professional installation is a smart option. Smart Lighting: Bulbs, Switches or Plugs? Connected lighting is possibly the easiest smart home technology to own. It installs easily and enables you to light any room in your house either automatically, or using your smartphone as a controller. There are three ways to get smart lighting. Smart bulbs screw into a light socket like a traditional bulb, with the smart technology in the base of the bulb. Smart switches are installed in your wall in place of your old light switch. They're much harder to install, but look great and allow you to use ordinary light bulbs with your smart lighting setup. Perhaps the most versatile option is the smart plug. It's a connected device that you plug into a wall socket, and plug a lamp or other lighting device into. Smart plugs are as easy as smart bulbs to install, can be fully automated as part of a smart home solution, and work with most plug-in electrical appliances, as well as lighting, giving you another way to save energy. It's easy to ‘go it alone' with smart lighting, buying your devices online and installing them yourself—but if you're planning a full smart home upgrade, you'll get more value from smart lighting installed as part of a solution. That's because, like a smart thermostat, your smart lighting devices will have access to intelligence from all around your house, enabling them to do smarter, more proactive things for you. You can have your lights turn on automatically when you're on your way home, for example, or when you disarm your smart home security system or unlock your front door's smart lock. You can also integrate them into automation 'scenes', where you control multiple devices with the touch of a single button on your smartphone. Interested in a smart home solution? 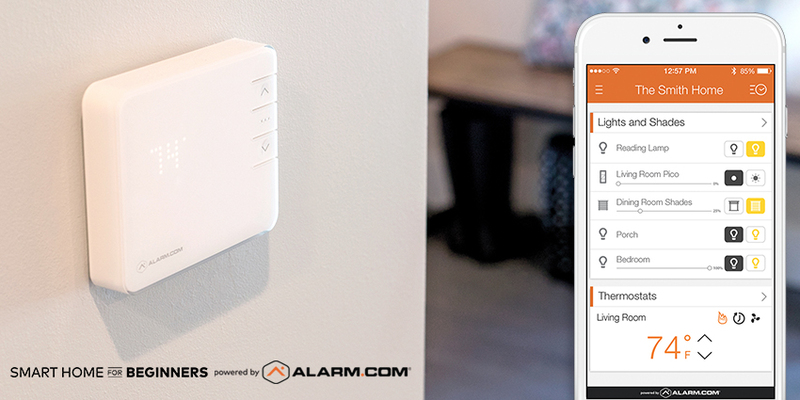 Alarm.com, which powers millions of homes in the US, is the easy, affordable and professionally-supported way to upgrade your home with cutting edge smart technology. Millions of homeowners trust our technology to make their homes safer, smarter and more efficient. To discover more advantages of building your smart home with Alarm.com, click here.